An exhibition at the Architectural Association presenting a series of newly commissioned models of former Archigram member David Greene has me revisiting and reading their works. I’m curious as to how the experimental architecture group’s work was received at the time. It would seem to be perceived by outside architectural thinkers to be of ridiculous thought, seeing that the work even by today’s standards is somewhat progressive. Their concepts however, while a little off target have been relevant for predicting and addressing urban issues. David Greene foreshadows in his audio visual piece entitled ‘The World’s Last Hardware Event’ (1967) and imagines a world where man can wander, carrying his architecture in his pocket (preempting the arrival of mobile phones and memory sticks). 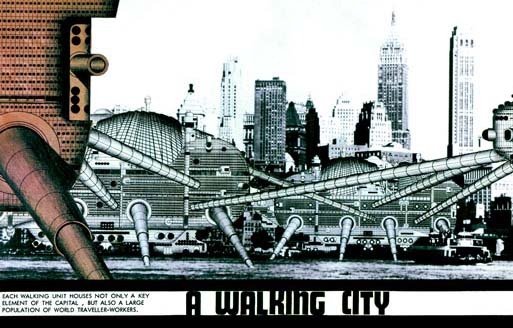 Ron Herron’s Walking City envisions whole cities gliding across the landscape, pausing to plug into utilities and information networks at chosen locations. David Greene described Walking City as a “frightening expression of the current cultural condition of restlessness” or as an eager anticipation of a mobile world with a global information network in which political boundaries and cultural differences would melt away. In know way as austere as Herron’s walking robotic imagery, but the rise in popularity and availability of prefab architecture and grid free systems allows for a mobility and lighter hand on the land, lending to a theoretical assumption that perhaps the walking city might one day in some form materialize. Something we’ve briefly touched on here at D.U.S. is the vision of a seamless integration of technology and nature. We weren’t the first to think of such an idea. 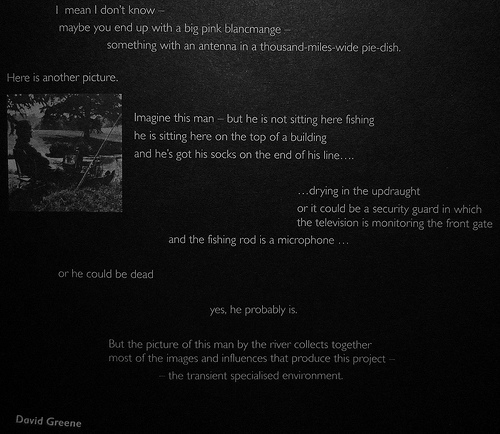 In David Green's 1969 L.A.W.U.N. project he speculated that eventually it would be possible to create a 'fully serviced natural landscape', or Bottery, in which the natural world looks just as it should but is serviced by unseen networks, otherwise known as L.A.W.U.N. - Locally Available World Unseen Networks. Discreetly installed all across the world, Logplugs could be located by the traveller using a mobile dashboard and homing device. Having plugged into the log and selected the required services, the traveller would pay for them using an attached credit card machine. “The whole London or New York will be available in the world’s leafy hollows, deserts and flowered meadows”. Greene’s vision of a fully integrated technological environment seems to foretell of the modern day invisible informational architecture known as WI-FI. Could his “homing device” be construed as an iphone, with the inherent ability to locate signal? A traveler, stripped from the shackles of an abundance of infrastructure can now roam freely through nature. Could the increased development of metamaterials mask objects never intended for invisibility? It would seem so. Using WI-FI and personal solar packs we're able to evade miles of underground electrical lines to accommodate Greene's vision of technological connectivity in nature. I'm currently re-reading Ian McHargs Design with Nature, and as he writes of the healing power of natural elements, the idea that nature is here, we're a part of it, we come from it, and it's positive effects can maintain psychological stability, I'm curious if our access to mobile technology negates the serenity of the wild? Is it "nature" if unnatural objects are still present but invisible? Are we in nature if we can be reached by our iphones? I actually think this is a serious question if its believed or not, or to what level nature plays as a human necessity. The way we situate are lives, design towns and cities around this belief could have lasting effects.